Series Isolation Transformer 150w 20a / 6.6a - L830-19 - These transformers are FAA approved and made in the USA. These series isolation transfomers are certfied to FAA L-830 & L-831 and approved according to FAA circular 150/5345-47. 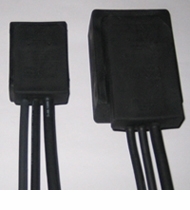 They can operate with 50 or 60 Hertz frequency and are used to isolate high operating voltages. Since they are encapsulated they can operate while submerged in water. All transfomers are 100% tested for visual, ratio testing, heat testing, and HIPOT testing.They also recieve a 12 hour water soak.